The Tesla Model X is a dog lover’s dream SUV. The spacious interior, the easy-entry Falcon wing doors, the quiet smooth ride, and Autopilot (see this full Autopilot review) are all hits with pets that ride in Tesla Model X. The interior configuration, in particular, is amazing since you can choose from several different variants, including the 5-seater standard to the 6-seater with a space in the second row that’s perfect for your pooch. Plus, you’ll have plenty of space left over in the trunk and the “frunk” (front trunk) to carry cargo and supplies. Thinking of getting a Model X? Use a Tesla Referral Code to get free Supercharging for a limited time. The five-seat configuration is the standard configuration for the Tesla Model X. In the five-seat configuration, you can either fold the back seats into the false floor or take them out completely. You can remove the false floor to give your canine companion some extra room in terms of depth. The added space works well for medium-sized to large dogs, or if you have more than one dog. To protect the seats you can try something like these Arcabros seat covers. There are several ways to protect the floor and sides with your dog in the back. The easiest way is to lay down a blanket, large piece of canvas or some other type of cloth that serves as a buffer between Rex’s claws and your Model X. You can buy specialty products made just for the Model X that turn it into the perfect dog mobile. One cargo cover sold by Evannex is made of nylon and vinyl. It has side flaps the cover the back part of the middle row of seats and either side of the interior. The rear door closes on the back flap to keep your dogs from scratching anything on the way in and out of the cargo area. The sides stay up thanks to hook-and-loop attachments. Canvasback also has a convenient cover for your Model X cargo area. The nylon does a few things. One Model X owner said he uses a nylon carpet for fur control. The nylon attracts dog hair, thereby saving the interior of your Model X from growing an extra layer of fur. This owner also lays down a little foam pad for some extra cushioning against the hard floor. Custom-made cargo covers, a blanket or a pet bed are great solutions for large dogs that can’t fit in a cage or when a cage doesn’t fit in the Model X’s cargo space. Extra padding makes the ride more comfortable for your pet, even if you put a cage inside. When you order the six seat configuration of the Model X, you’ll have a center aisle in the second row that lets people and pets easily move around. This works perfectly for family vacations and any size of dog. Tesla owners tout the six-seat arrangement for huskies and Labrador retrievers. One owner says her old black lab has a little room to move because the dog has trouble walking. Another owner says having a nice row to walk lets your dog stick his head up between the two front seats if he needs to say hello. The six-seat arrangement allows your pooch to be a part of his family on long trips. He can lay down and stretch out, or sit on his haunches so your kids can pet him. The dog is happier among his human companions. If you have all four rear seats occupied, the dog can keep your kids occupied on long trips, as well. That makes everyone happy. Six seats works better for long trips, but a five-seat configuration works well for running errands and when you’re the only human in the vehicle. If you need something more sophisticated than just a blanket or bed, Peter Walkerof Great Britain came up with a brilliant idea for his medium-sized furball inside the Model X. He and his wife, much to the chagrin of their local pet store, tried out several dog cages right at the pet store. They unpacked boxes, fully assembled the cages, and placed them inside their Model X before deciding on one. Walker had his Model X for all of two days when he bought the cage, a Kong At Home model made for medium-sized dogs. The cage measures 30.75 inches long by 22.125 inches wide by 21.125 inches high. Walker shows how the cage fits perfectly into the cargo space. It’s stable enough that it doesn’t shift around, and it goes up against the lip of the rear trunk space to keep the cage in place. Walker lines his cage with a soft blanket and secures some of the fold-up parts of the cage with stretch cords to prevent rattling noises. Watch Walker’s two-minute video as he explains the practical aspects of the cage while providing visuals. The Model X is spacious enough for your dogs, but the roomy interior isn’t the only feature that maintains your dog’s safety. One cool (literally) feature on the Model X is that the air conditioning can run without the motor without losing its effectiveness to keep the interior cold in the summer and warm in the winter. That means you can leave your dogs inside, with the windows rolled up, during your shopping excursions or when running errands. Of course, you don’t want to leave your dog alone for too long inside your Model X because he eventually needs to eat, drink and poop. One Tesla owner created a static sign that appears on a window. It says that the dogs inside the car are fine and that the temperature is controlled by an app. The sign also states that the temperature inside is a comfy 65 degrees Fahrenheit and that there is no reason to break the window or call the fire department. The owner then has his cellphone number for people to call and he thanks them for caring. The sign is a wonderful way to alert someone that yes, your car is so awesome your canines are comfy and cozy inside. Tesla owners have the option to control the temperature from their smartphones with an app. The app shows the internal temperature of the vehicle so you can make adjustments. This is handy for when you’re in the store and the outside temperature changes. The lone downside about running the air conditioning is that it drains your electric charge. One Tesla owner said running the air for 11 minutes reduced the temperature from 110 degrees to 70 degrees, but it drained 3 miles of charge. He said it was a small price to pay for having the right temperature on a hot day. 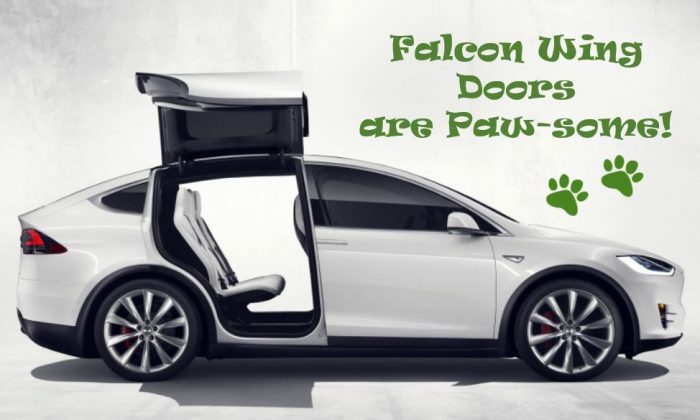 The falcon wing doors on the sides are another way the Tesla Model X protects your dog. While the back cargo door should be high enough, the falcon wing doors open completely out of the way so Fido doesn’t hit his head on the door when jumping out. The automatic feature also prevents the doors from accidentally closing on a paw or tail. The only difficulty with the falcon wing doors is training your dog to wait to get out until the doors fully open. That’s when “Sit” or “Stay” come into play. Your dog is already excited about going for a car ride, but you should be safe, too. The Tesla Model X is the perfect dog mobile thanks to its internal configuration and automated features that other vehicles just don’t have. Add happy dogs to a long list of why Tesla rules and other car companies drool. Need a Model X Referral Code? Thinking of getting a Model X and want free Supercharging? Use this Tesla Referral Code to get free Supercharging for a limited time.